It's important to choose the correct spider pest control because 99% of all spiders are harmless and actually beneficial in nature, in your home and garden. 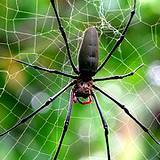 There are approximately 40,000 species of spiders worldwide. They are beneficial insects that kill more bugs than birds do and the total weight of bugs that spiders consume in one day are more than the weight of all the humans on earth. 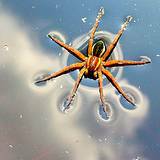 Interesting fact about spiders Do you know that on any given day you are most likely not more than 12 feet away from a spider at any time? Spiders only live for about one year. They are actually welcome in most homes, in China are so revered that farmers build them small teepee-type homes to hibernate in during the winter months. Spiders only purpose in life is to build spider webs, eat bugs, and produce more spiders. Cobwebs are draglines laid down by spiders wherever they go and used to drop from one place to another and avoid danger. When these draglines get coated with dust they become cobwebs. Arizona Brown Spider is a species of brown recluse spider found in Arizona. It has two body parts, eight legs and 3 sets of eyes. You'll see a distinct violin shaped marking on top of its head. It's yellowish to brown and about ¼ to ½ inch long with long thin legs. They mate February to October and deposit 40 to 50 eggs in silken egg cases. They can live up to 2-4 years in good environmental conditions. They eat small insects and can survive without food from 6-12 months. The Arizona Brown Spider has a toxic bite and you should consult a physician right away if bitten. That's why it's best to wear gloves and use a soapy spray directly on the spiders to kill them. This is the best natural spider pest control tip to kill an Arizona Brown Spider. Black Widow (poisonous) their outer covering is very shiny black with a red hourglass on the underneath side of their abdomen. It is said that after mating the female will kill and eat their mate but research has noticed that this isn't always true, sometimes they allow their mate to stick around awhile. Females live 1-3 years and lay 25 to 250 eggs in a white silken case suspended from the web. Males live about 1 year and aren't dangerous to humans. The female black widow will only bite you if your provoke them, they prefer to run away if they have a chance. Their bite is very painful and medical treatment may need to be initiated immediately. Besides the bite being painful you might also experience severe cramping, nausea, sweating and fever. Always use caution when dealing with spider pest control and a black widow spider. Spray with a strong soapy solution. Spray all cracks and areas where they are located. It's best to spray the area at least once a month. Brown Recluse (poisonous) are usually found in wooded area, attics or woodpiles. 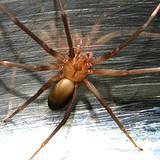 They are a yellowish/tan to dark brown spider and have a light colored, violin-shaped mark on its head and body. It's a small spider with long slender legs and has 6 eyes. 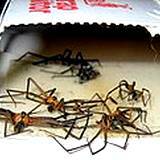 You can find a brown recluse spider in old piles of paper, woodpiles, back of closets and even clothing that has not been worn for a long time. Always remember to wear gloves when working in these areas. A soapy spray will get rid of them. Their bite requires immediate medical attention since its poison causes destruction of tissue and the area is very slow to heal. Crab Spider are white or yellow and just wait to ambush their prey. They are capable of changing colors depending on their environment and will blend in the most types of trees, flowers or bushes making them very hard to spot. Their bodies are short, wide and relatively flat. There are about 200 species in North America. Tips for natural spider pest control are below for crab spiders are listed below. Jumping Spider forage for their prey in the daytime and may be seen on windows, walls, or other areas where insect prey may be drawn to. They approach a prey slowly and, when close, make a sudden leap upon it. Before jumping they attach a silken thread or safety line, which is used to climb back if they miss their target. They have excellent vision, which helps them hunt and destroy their prey. These spiders are small to medium in size, with stout bodies and short legs. The group has a distinctive eye pattern, composed of 3 or 4 pairs, with the largest pair in the center. The body is rather hairy and if often brightly colored or iridescent. Jumping spiders are not poisonous, though as with all spiders, bites may cause reactions in certain individuals. See below for tips on natural spider pest control for jumping spiders. Lynz Spider are hunting spiders that spend their lives on plants, flowers and shrubs. Nimble runners and jumpers, they rely on their keen eyesight to stalk, chase or ambush prey. Six of their eight eyes are arranged in a hexagon-like pattern, a characteristic that identifies them as members of the family Oxyopidae. They also have spiny legs. They are more common in the southern United States. They use their green camouflage to sneak up on their victims in the daylight. See tips below on natural pest control and Lynz Spider control. Red Spiders are usually found on plants that have poor air circulation and suffer from malnutrition or lack of adequate water. Spray the plant with a mild soapy water solution for spider pest control, then feed and water the plant well. Tarantulas are hairy spiders with 8 legs and 8 eyes set close together. They have 2 large fangs under their abdomen and that's what makes them seem more dangerous than they really are. Males will perform a courtship dance to attract the female, mating will occur, than the males die a few months later. Females lay eggs in a cocoon within her burrow and she guards the cocoon for 6-9 weeks until 500-1,000 spiderlings hatch. 2-3 weeks later young will leave the burrow. Female stores sperm and will continue fertilization the remainder of her 25 year life span. They are reddish-brown, dark brown or black in color. They are 1 to 5 inches in length, have a bald spot on abdomen, and urticating hairs. These hairs are rubbed on to predators for defense, which causes itching and rashes on their victims. Tarantulas live in burrows and go hunting after dark. See below for tips on spider pest control and eliminating Tarantulas around you home and property. Fresh chestnuts have been used for centuries to chase spiders. You have to use fresh crushed chestnuts anywhere you find an entry point, it will stop them in their tracks and they will run away. Pennyroyal will chase spiders away, just sprinkle pennyroyal in area that spiders frequent and they will never come back. You can buy pennyroyal in any health food store. Once you notice a problem area that seems to always end up with cobwebs just take a solution of about a cup of white vinegar with a teaspoon of coconut oil added. Spiders will move out of that corner once and for all. Mix 1 ounce of table salt in 1 gallon of warm tap water, shake well to make sure the salt dissolves. Spray directly on the spiders to kill them, especially if you see a nest. Make sure you don't spray around your plants. Just one drop of these oils in 1 quart of water will kill spiders. As you can see there is such a variety of natural ways spider pest control can be dealt with without the worry of expensive chemicals that can harm your home environment, family or pets. Just keep in mind that most spiders are actually beneficial to your garden and will help eliminate many pests that are more dangerous to have around. So think twice before choosing which spiders to chase and which spiders to kill.